Iron plays a critical role in helping to maintain healthy red blood cells and carry oxygen through our blood. It also helps the body’s immune system function properly by defending us against bacteria, viruses and other unsavory things that could make us ill. It is not commonly known that iron also plays a role in metabolism, regulating the body’s temperature, and it even helps to ensure healthy cognitive development. Iron is one of the most important nutrients that a developing baby needs! The vast majority of babies will not become iron deficient if they do not eat a fortified baby rice cereal, nor will they become iron deficient if they do not receive supplements unless there are underlying factors such as preterm birth, low birth weight or a mother who had a poor nutritional status during pregnancy. Iron is found in two different forms, heme and non-heme. Heme iron is the form of iron that our bodies best absorb and use most efficiently. It makes up about 40 percent of the iron in meat, poultry including eggs, (in particular the yolks), and fish. Non-heme iron is present in animals but it makes up all of the iron in plants (fruits, vegetables, grains, nuts). Non heme iron is not absorbed or utilized by the body as well as heme iron is. How much iron does a baby need? What iron rich foods can I feed baby? 0-6 Months: for infants from 0-6 months the 0.27 milligrams of iron per day. 7-12 Months: for babies 7-12 months, the RDA for iron increases to 11 milligrams per day. When a baby reaches the age of 1 year, the recommended daily allowance actually decreases to 7 milligrams per day. Once children reach the age of 4-8 years old, the iron recommendation goes back up to 10 milligrams per day. These daily recommendations apply to both male and female children. Once girls reach the age of fourteen, their iron requirements increase more than those of boys. The increase in iron requirements continues to be gender driven up until the age of 50 years. 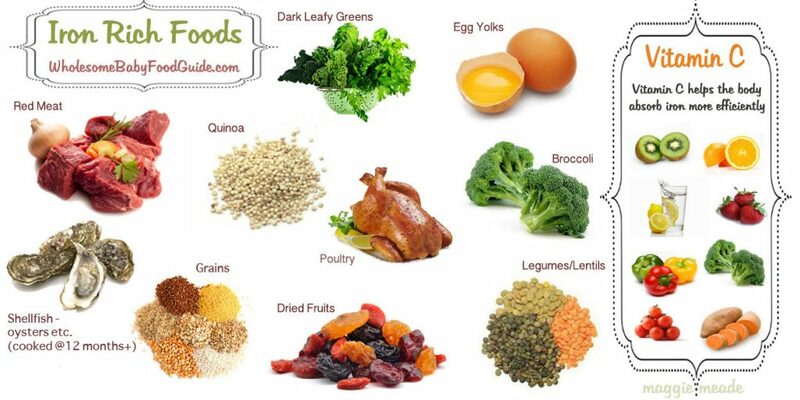 Some foods that are rich in iron may be found listed below. You should try to serve your infant at least 2 of these foods every day (ensure that the foods are age appropriate) once he has begun to decrease his breast milk/formula intake and begins to eat more solid foods. While the amounts of iron in the above table may seem small, let’s put this into perspective. If you look at the RDA for infants between the age of 7 and 12 months, you will see that 11 mg of Iron is the recommendation. If you are formula feeding, your baby will receive approximately 1.4 mg with every 2 ounces he drinks. If you are breastfeeding your little one he may receive less iron, however the iron he does receive will be more readily available to his body. According to the National Institutes of Health, Office of Dietary Supplements, it is estimated that 50 percent of the iron from breast milk is used and absorbed by babies while the iron in formula is only 12 percent utilized. During the day, a 9 month old may drink up to 24-31 ounces of formula. Let’s assume he drinks 25 ounces. At 25 ounces, he would receive approximately 18 mg of iron! You have met the 11 mg RDA and then some through formula alone! Exceeding the RDA for iron from food or formula/breast milk sources is not harmful however overdosing with iron supplements can be dangerous. To help with the absorption of iron, serve foods containing Vitamin C with a meal.